The WH92 is an extremely unique chair that was developed as a hybrid of the DB family with models from the Wharton Collection. Featuring the benefits of a foam insert that helps free your shoulder blades from being blocked, the WH96 also offers a more adjustable version of the same "clean-design" control of the Wharton Premier series. What this means is that even on this synchronized knee-tilt model, you have the option of an independent back angle adjustment. Most exciting of all, though, the entire Wharton Collection now features the unbelievable sigh-producing comforts of Office Master's exclusive Double Comfort Seating (DCS) Technology. This DCS Technology was specially developed by Office Master to provide simultaneous softness and support, all in the same amazing seat cushion. For more information about DCS Technology or the concept of Scapular Impedance, visit our Ergonomic University section. 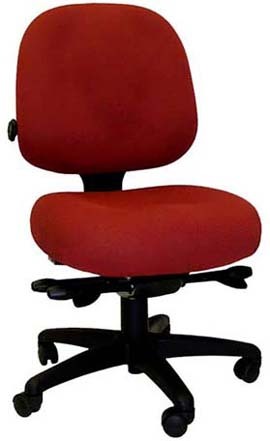 Overall Height 33" - 42"
Seat Height 17" - 22"
The back support of this chair is upholstered in front only and the back part is "Black Plastic". Please specify if you want both sides of the back support to be upholstered for extra charge. 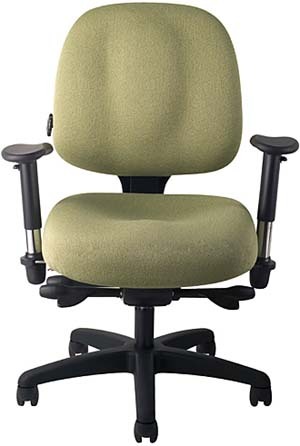 Standard Approximately 17" to 22"
The discovery back series feature the sigh-producing comfort afforded by Office Master's Double Comfort Seating (DCS) technology. This unique layered system of self-conforming memory foam, combined with firmer Office Master high-resilience cushioning, results in a experience that is at once soft and supportive, and truly beyond compare. With a forward-thinking ergonomic design that prevents scapular impedance and the sigh producing comfort of DCS Technology, users will feel refreshed rather than fatigued at the end of the day.